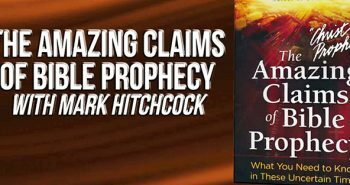 In October 2009 I was interviewed by Bill Salus, author of the popular Psalm 83-themed book Isralestine, host of the radio program “Prophecy Update,” and evangelist on the end times website Prophecy Depot. 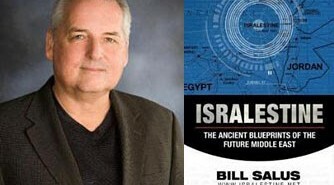 Bill and I spent much of the interview discussing my recent article The Wars of the End Times. 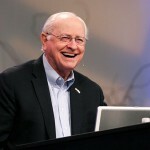 Bill has been kind enough to allow The Christ in Prophecy Journal to reproduce the “The Nine End Time Wars of the Bible” interview in transcript form, edited into an article series. To listen to the original radio program in mp3 format, I invite you to visit Prophecy Depot or KWBB. In the last segment, Bill and I discussed end time wars 3 and 4 — The Conventional War of the Tribulation (Revelation 6) and the Nuclear War of the Tribulation (Revelation 8 & 9). In this segment, we look at the fifth and sixth end time wars in the series. What’s going on with the fifth war — The War in the Heavens (Revelation 12)? Dr. Reagan: The fifth one I mentioned in my article is the only one that is supernatural in nature, although the others have supernatural aspects to them. For example, Ezekiel 38 and 39 has a supernatural aspect in that during the Russian invasion Russia and all of its allies are going to be supernaturally destroyed by God on the hills of Israel, in such a way that even the Israelis will know that it came from God. So, that is going to be a supernatural destruction. But, the fifth war is truly supernatural in every aspect of it because it is mentioned in Revelation 12, and it is a war in the heavens between the forces of Satan who infest the atmosphere of this planet and Michael the Archangel and the armies of God. Evidently it is an attempt by Satan to take the Throne of God one last time. Michael intervenes and he and his angels defeat Satan and his demons. Satan is thrown down to Earth at this point, and when he comes down it is in great wrath because he knows his time is short. This shows Satan knows Bible prophecy because he realizes that when his access to Heaven is cut off and he is thrown down to Earth he has very little time left. So, this is a supernatural war in the heavens. Satan is thrown down, and when he comes down to Earth the very first thing he does is to possess the Antichrist and give him even greater power. 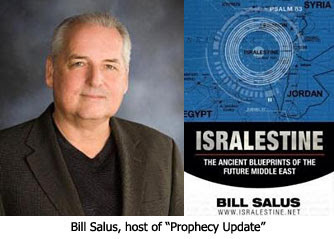 Bill Salus: You are talking about the war referred to in Revelation 12:9-10. Knowing that his time is short, does Satan conduct the sixth war — The War Against the Jews and the Saints (Revelation 12)? Dr. Reagan: That is indeed when the war against the Jews and the Saints occurs. By “saints” I mean those who have accepted Jesus during the Tribulation. There is going to be a great harvest of souls during the Tribulation. Some people will turn to Jesus Christ as a result of the Rapture. They will have been told that it is going to occur. I think the Rapture itself is an event that will cause many to turn to the Lord. Others will come to the Lord as the result of the witness of the preaching of the two great witnesses of God that will be preaching in Jerusalem during the first 3 1/2 years before they are killed by the Antichrist. And then, there are also going to be Bibles everywhere. I have marked up my Bible really well so that a person won’t have to search diligently, but they can find the key Scriptures. There will be Scripture everywhere. There is going to be all kinds of information on the internet before the Antichrist can close it down. We’re posting videos right now for people who are left behind, and others are doing the same thing. There is going to be 144,000 Jews who are sealed of God who will be out preaching the Gospel. We are told right at the end of the Tribulation what I call the “Gospel Angel” will be unleashed by God. He will circumnavigate the globe and preach the Gospel to every person on planet Earth before the final pouring out of God’s wrath. 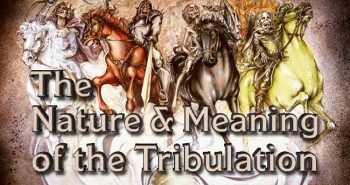 So, there are going to be a great number of people saved during the Tribulation, though most are going to be killed by the Antichrist, some will live to the end. It appears that in the middle of the Tribulation after this supernatural war in Heaven when Satan is cast down and he posses the Antichrist, Satan will then empower the Antichrist as he has never been empowered before. The first thing he will do is turn against the Jews. He will double-cross them and he will declare himself to be God. They will, of course, reject him as God, and in his fury he will try to annihilate every Jew on planet Earth. We are told in the book of Zechariah that two-thirds of the Jews will die during the last 3 1/2 years of the Tribulation. It is going to be a holocaust as great if not greater than the Nazi Holocaust. Satan hates the Jews because they are the chosen people of God, because they gave the Scriptures to the world, and because it was through them the Messiah was sent. Because God has promised He is going to save a great remnant, Satan doesn’t want God to keep that promise, and so he will go after every Jew and every Gentile believer on planet Earth during that last 3 1/2 years. My personal belief is that during that time when he is so obsessed with this, so obsessed with the annihilating the Jews and all believing Gentiles, that his worldwide kingdom will start falling apart because he will not be paying attention to it. Bill Salus: We know that the Antichrist will want a war against the Saints because of the spread of the Gospel, but why war against the Jews? Well, I think you said it when you brought forward their important role in God’s plan. Ultimately, if Satan can utterly destroy the Jews, he can prove God to be a promise breaker and justify his leaving his post of proper habitation. When these Jews are fleeing for their lives, many people teach that they are going to flee into southern Jordan, which is of course not under Israeli sovereignty as of yet, however it likely will be in the aftermath of Psalm 83. What transpires as these Jews flee? Where do you see them going? Dr. Reagan: Revelation 12:14 says that Israel will flee on the “wings of a great eagle,” which is a terminology taken out of the Old Testament when they fled out of Egypt. They came out on the wings of a great eagle, which is symbolic language for the fact that they came out under the protection of Almighty God. It says, too, that the army that is sent after them by the Antichrist will be swallowed up, probably supernaturally by God. In Daniel we are told that the Antichrist will not be allowed to go into that area which we today call Jordan, and so he will be kept out of the area. It could very well be that their hiding place would be someplace there adjacent to Israel, probably in Jordan as many have postulated, that it might be the ancient city of Petra which is located in a boxed canyon there. Bill Salus: Right, that is commonly taught. Identifying that location is picked up from Isaiah 63, where it shows the Messiah returning to Edom, which is Southern Jordan. Dr. Reagan: Yes, it always portrays the Messiah as returning from the East — from Basra — that area over there. It appears that he goes first there to perhaps pick up the Jews who are in hiding there and then comes on to Jerusalem and lands on the Mount of Olives. In the next segment, Bill and I will be discussing end time wars 7 and 8 — The Middle East Campaign of the Antichrist (Daniel 11) and the Battle of Armageddon (Joel 3, Zechariah 14, and Revelation 19). we know what the Bible says but have you ever imagined just exactly how aweful itll be with Satan himself literally walking on earth and alot of the demons who were previously bound also here on earth?